Lichen amyloidosis (LA) is a common form of primary cutaneous amyloidosis. 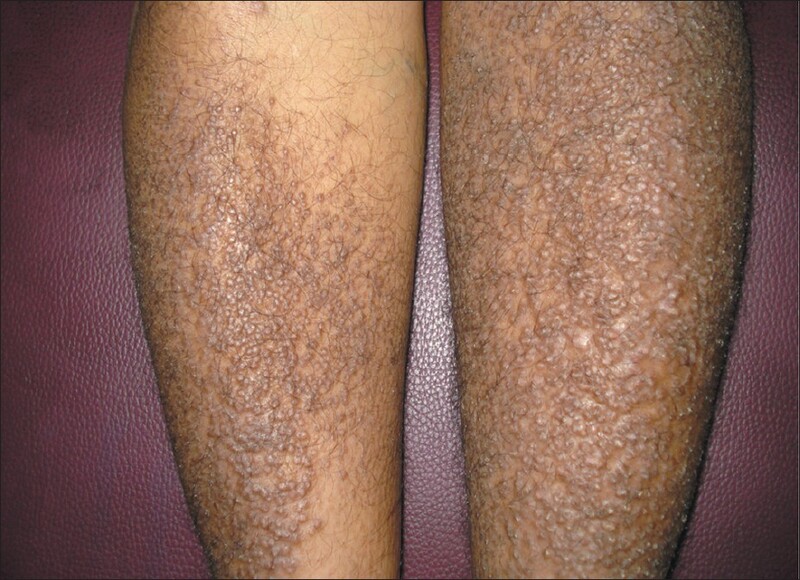 It usually presents as persistent, pruritic, hyperkeratotic papules that may coalesce to form gray-brown plaques, on the shins or other extensor surfaces of the extremities. The condition is resistant to treatment and various treatment modalities such as electrodessication,  dermabrasion, , pulsed dye laser  and frequency-doubled Q-switched Nd: YAG laser  have been previously tried with variable therapeutic response. Here we are reporting a case of LA which showed good response for Fractional ablative 2,940 nm Erbium: YAG Laser treatment. 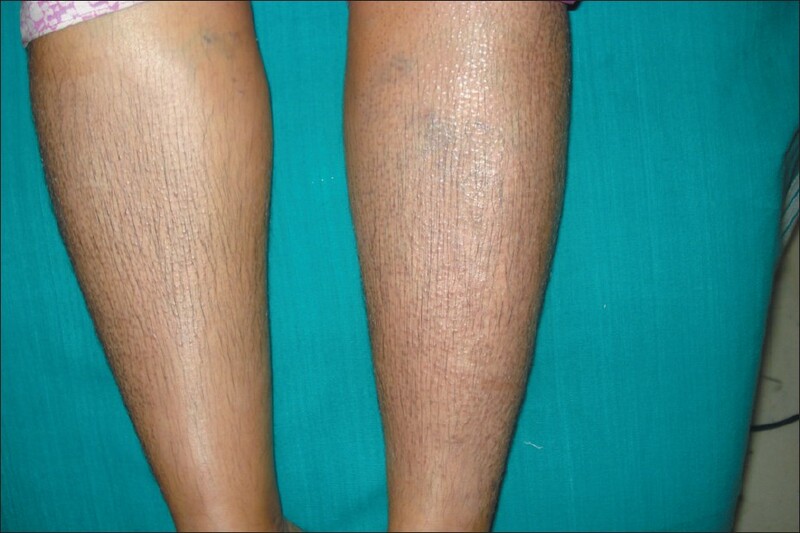 A 60 years old female patient presented with itchy eruptions on both legs of 15 years duration. Patient gave history of using a nylon scrub while bathing since many years. The condition had been resistant to treatment with topical steroids and salicylic acid. Medical history was unremarkable. On examination, hyperkeratotic papules were seen distributed bilaterally symmetrical on pretibial surfaces [Figure 1]. Routine blood investigations were within normal limits. A skin biopsy was taken with a clinical differential diagnosis of LA, prurigo nodularis, hypertrophic lichen planus, lichen simplex chronicus and pretibial myxedema. 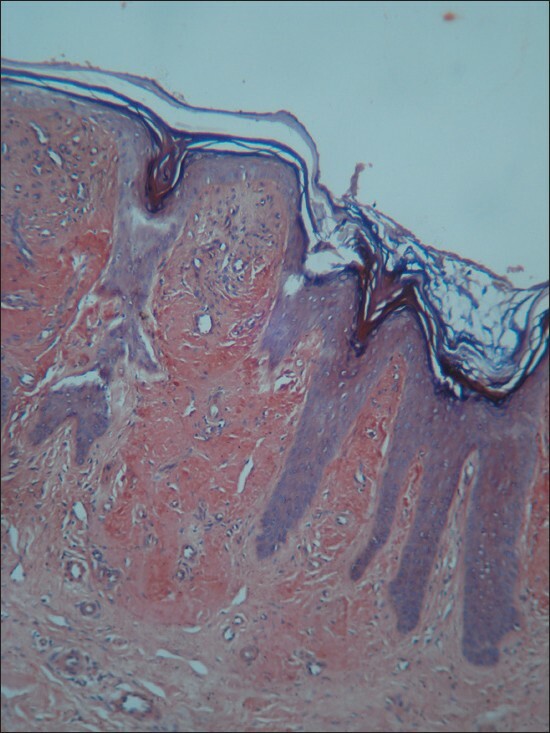 Hematoxylin and eosin stained section showed depositions of pink, homogeneous masses in the papillary dermis. 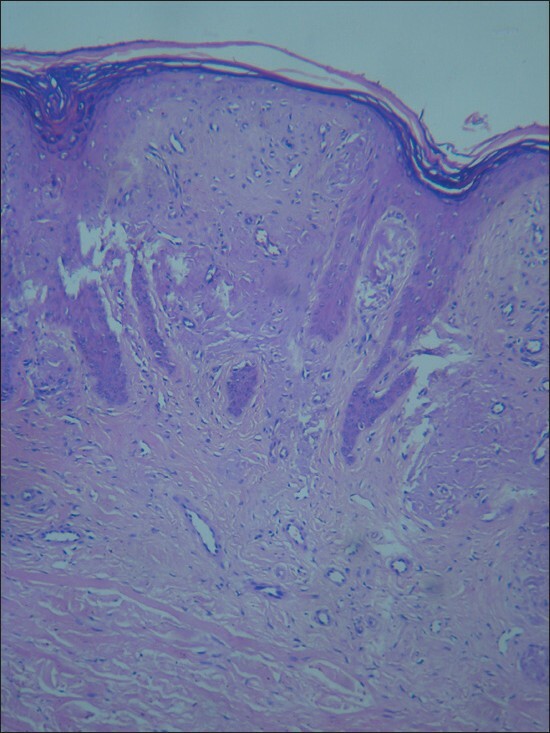 The overlying epidermis was hyperkeratotic and acanthotic. There was papillomatosis with a downward proliferation of rete ridges. The deposits expanded the papillae and the elongated rete ridges were displaced laterally [Figure 2]. The section stained positive with Congo red stain for amyloid deposit [Figure 3]. A final diagnosis of Primary cutaneous LA was made. As previous therapeutic responses to topical treatments were not satisfactory, it was decided to treat the patient with fractional ablative technology. Patient was subjected to fractional ablative 2,940 nm Erbium: YAG (Pixel Harmony, Alma) laser treatment. EMLA cream (2.5% lidocaine and 2.5% prilocaine in an oil and water emulsion) was applied to the treatment area for 45 min under occlusion before laser treatment. Long pulsed 2,940 nm Erbium: YAG laser was used with a spot size 9×9 mm and fluence 1400 mJ. Six to eight stackings were given at each spot. At the end of treatment, cold packs were applied to minimize patient discomfort. Patient was counseled with regard to sun protection and to apply moisturizer cream. After 1 week, she was advised to apply combination of steroid and keratolytic agent (Salicylic acid) cream till the next session. Laser treatment was spaced at 3 weeks interval. Mild erythema and edema was noted immediately after treatment which resolved within 48 hours. Skin peeling continued for 5-6 days. Significant improvement was noted after the second session of laser treatment. After 6 sessions, patient had 95% clearance of the lesions [Figure 4]. At the follow-up visit 6 months after the final laser treatment session, we noted that significant improvement was maintained without any visible evidence of recurrence and without any topical maintenance treatment. LA is a common type of primary cutaneous amyloidosis, presenting as pruritic papules and plaques on the shin or other extensor surfaces of the extremities, often with a rippled pattern. Initially lesions are usually unilateral and later develop bilaterally with symmetrical distribution. The exact etiology of primary cutaneous amyloidosis is not yet fully understood. Genetic predisposition, Epstein-Barr virus and environmental factors have all been proposed as possible etiologic factors. A common triggering factor is chronic rubbing and friction. The amyloid is thought to be derived from keratinocytes through filamentous degeneration  and hence is termed amyloid K. It has been postulated that in LA a specific immunological tolerance develops to the presence of the filamentous masses of degenerating epidermal cells so that amyloid can be laid around them by fibroblasts. While there are various treatment modalities for LA but the response is not satisfactory and the condition recurs frequently. Potent topical corticosteroids (under occlusion), topical calcineurin inhibitors, topical dimethyl sulfoxide (DMSO), intralesional corticosteroids, PUVA and UVB phototherapy, systemic retinoids, low-dose cyclophosphamide, cyclosporine have been used for medical management of LA. The physical modalities of treatment such as electrodessication,  dermabrasion, , pulsed dye laser  and frequency- doubled Q-switched Nd: YAG laser  where epidermis and part of the papillary dermis along with some of the amyloid was removed permitting re-epithelialization to occur from adnexal structures have been reported to be effective in the treatment of LA. Since amyloid K is derived from epidermis, fractional ablative effect of the laser could decrease the production of amyloid by affecting the process of keratinization. Erbium: YAG laser penetrates up to upper dermis where the deposits are found. Hence the deposits can get eliminated transepidermally through the channels created by the laser. Therefore, Fractional ablative 2,940 nm Erbium: YAG laser was considered for the treatment of LA in the index case. Fractional ablative laser has not been used in the treatment of LA earlier to the best of our knowledge. Since only fractions of affected skin are treated in any given session, multiple sessions of treatments were needed for optimum results. A very good response to the treatment with almost no side effects and without any significant downtime was noted. We believe that the technology can be safely used as an effective treatment for this otherwise difficult condition. Fractional ablative laser technology appears to be a suitable and well tolerated modality of treatment for LA. Larger controlled studies are required to further establish the efficacy of this new modality of treatment. 1. Aoki M, Kawana S. Lichen amyloidosis of the auricular concha: Successful treatment with electrodessication. J Dermatol 2009;36:116-7. 2. Wong CK. Amyloid treatment. Clin Dermatol 1990;8:108-11. 3. Wong CK, Li WM. Dermabrasion for lichen amyloidosus. Report of a long-term study. Arch Dermatol 1982;118:302-4. 4. Sawamura D, Sato-Matsumura KC, Shibaki A, Akiyama M, Kikuchi T, Shimizu H. A case of lichen amyloidosis treated with pulsed dye laser. J Eur Acad Dermatol Venereol 2005;19:262-3. 5. Liu HT. Treatment of lichen amyloidosis (LA) and disseminated superficial porokeratosis (DSP) with frequency-doubled Q-switched Nd: YAG laser. Dermatol Surg 2000;26:958-62. 6. Black MM, Upjohn E, Albert S. Amyloidosis. In: Bolognia JL, Jorizzo JL, Rapini RP, editors. Dermatology. 2 nd ed. Mosby Elsevier Publishing; 2009. p. 623-31. 7. Black MM, Wilson-Jones E. Macular amyloidosis: A study of 21 cases with special reference to the role of the epidermis in its histogenesis. Br J Dermatol 1971;84:199-209. 8. Kumar B, Dogra S. Metabolic Disorders. In: Valia RG, Valia AR, editors. IADVL Textbook of Dermatology. 3 rd ed. Mumbai: Bhalani Publishing House; 2008. p. 1313. 9. Goel A, Krupashankar DS, Aurangabadkar S, Nischal KC, Omprakash HM, Mysore V. Fractional lasers in dermatology - Current status and recommendations. Indian J Dermatol Venereol Leprol 2011;77:369-79.